A sharply defined skyline outlines downtown Winnipeg as thousands delight in our capital city's lively, spirited style. A cultural playground beckons with offerings of world-class ballet, theatre, symphony, and opera. The hottest casinos, music clubs and restaurants keep pace with a vibrant nightlife. 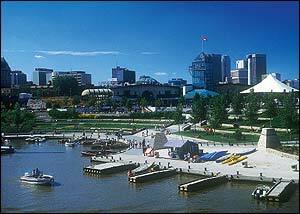 Walk, dine, shop, and play at The Forks, a historic junction that's emerged as Winnipeg's favourite meeting place. Take a stroll down the famous riverwalk or watch a live performance on the outdoor stage. Relax and unwind in the serene open spaces of Assiniboine Park. Watch swans on a quiet pond. Smell the fragrant blooms in the lush conservatory or gaze at exotic animals in the park zoo. Winnipeg is renowned for its vibrant multicultural life. Experience the richly layered traditions of our ethnic communities through a variety of festivals, museums, galleries and events. 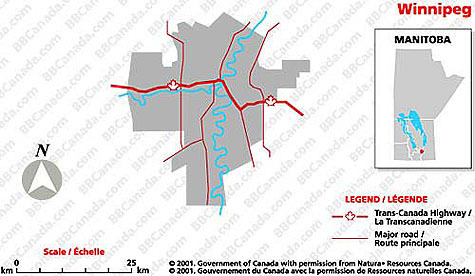 Winnipeg - a city of boundless energy and opportunities.